of National Novel Writing Month. Congratulations for participating in National Novel Writing Month! As writers ourselves, we know that writing 50,000 words in a month is no easy feat. You’ve completed the exhausting, arduous task of writing a novel in one month and you should be proud. The purpose of NaNoWriMo isn’t to write the next great novel in a month. Not even Charles Dickens could have done that! The idea is just to write; quality doesn’t necessarily matter in NaNoWriMo—quantity is the only measurement. Now that you’ve spent the month of November writing a novel, you’ll need to concentrate on reading over your work and making revisions. The editing process can be long and hard, but is ultimately very rewarding and results in a clean and polished novel. This is precisely where our editors can help. As a sponsor of NaNoWriMo, we are offering all participants 10% off our Manuscript Editing Services beginning December 1, 2011. Constructive feedback and revision from a professional editor will result in a stronger and much improved manuscript. 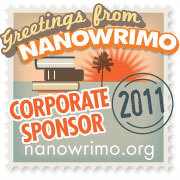 Enter coupon code NANOWRIMO2011 at the checkout to receive a 10% discount on our manuscript editing services. The first 50 people to submit their NaNoWriMo manuscripts to be edited by our manuscript editors between December 1, 2011, and January 31, 2012, will be entered to WIN their edit. That’s right. Once we have edited 50 NaNoWriMo manuscripts, one of those lucky clients will get their manuscript edit for free. Remember, as a NaNoWriMo participant, you can also save 10% on Scribendi.com’s manuscript editing services from December 1, 2011, to August 1, 2012. Just enter coupon code NANOWRIMO2011 at checkout. For more contests and free writing resources, follow @Scribendi_Inc on Twitter and become a fan of or “like” Scribendi Proofreading and Editing on Facebook.